Otunba Senbore holds a BSc (Economics) degree from the University of Ibadan. He is a fellow of the Institute of Chartered Accountants of Nigeria (ICAN) and the Business Recovery and Insolvency Practitioners Association of Nigeria (BRIPAN). He began his career in 1967 with Coopers & Lybrand (now Pricewaterhouse Coopers) where he was a Partner from 1975 to 1991. 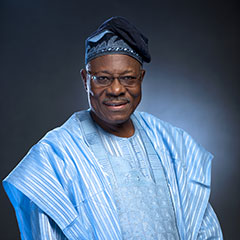 He subsequently worked with FCMB as an Executive Director from 1991 to 1994 before joining IFAMS Limited (Financial & Management Consultants) in 1994. He served on the Board of First Bank of Nigeria Plc as a Non-Executive Director (1990 to 1991), and on the Board of UBA as a non Executive Director (1992 to 1993). He has over 40 years experience in the financial services industry. Otunba Senbore is currently the Chairman of Olutola Senbore & Co. (Chartered Accountants).